Eggplant is low in calories -- just 20 calories per cup, mostly from carbohydrates, a potent source of energy. It comes loaded with vitamins and minerals, but its health benefits extend beyond just adding vital nutrients to a meal. Eggplant contains other compounds that promote good health as well, even to the point of helping to prevent cancer and lowering cholesterol. Once you realize how beneficial eggplant is to your health, you may want to give more consideration to it becoming a regular part of your diet. Chlorogenic acid is a plant compound that is known for its high antioxidant activity. Antioxidants shield your cells from oxidation -- a harmful chemical process that damages your cells and contributes to disease. Researchers at the U.S. Department of Agriculture's Agricultural Research Service found chlorogenic acid to be the dominant antioxidant compound in eggplant. They report that this is significant because chlorogenic acid has a great capacity to fight free radicals -- the chemicals that cause oxidation -- and is also able to lower LDL (bad) cholesterol. Chlorogenic acid is also antimutagenic, which means it can protect cells from mutating into cancer cells; and it is also antiviral. Nasunin is an antioxidant compound found in the peels of eggplant. 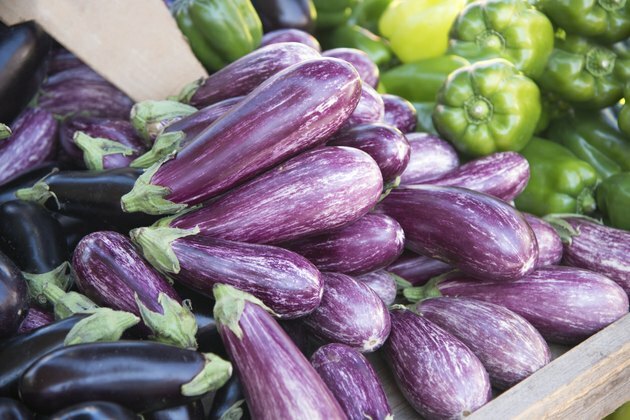 The August 10, 2005 issue of the "Journal of Agricultural and Food Chemistry" reports that a study shows the nasunin in eggplant has antiangiogenic abilities. The Cancer Center at the Angiogenesis Foundation explains that when something is angiogenic, it stimulates new growth of blood vessels and blood supply. While that sounds like it could be a good thing, when it comes to cancer, it is not. Cancerous cells can gain angiogenesis ability, which means they can develop a means to increase their own blood supply, which can cause a cancerous mass or tumor to grow rather quickly. Nasunin in eggplant has the ability to prevent angiogenesis from occurring. Eggplant is also an excellent source of dietary fiber, which can help protect against type 2 diabetes and keeps the digestive system regular. The vitamins in eggplant consist primarily of vitamin A (in the form of beta-carotene), B vitamins, folate and vitamin C. Eggplant is also rich in minerals, boasting a large quantity of potassium, magnesium, calcium and phosphorous. With no fat, six carbs and 27 calories in a 1-cup serving, eggplant makes an excellent addition to any diet. How Many Calories Are There in Eggplant Parmigiana? What Are the Health Benefits of Artichoke Hearts?